Friend or Foe? is one of the most recognized works by either Miho, yet the narrative behind the work is more obscure, an allusion to a lesser known segment of twentieth-century military history: when civilians guarded the skies. Although aircrafts first appeared in combat during the first World War, it was with the bombings of World War II that aviation became the most devastating form of combat. In an era when RADAR was first being developed and used for military purposes, members of the armed forces and civilian auxiliaries alike were trained to identify both Axis and Allied aircrafts, a regimen that prepared ground observers to distinguish “friend from foe” upon sight. Official groups of civilian volunteers in both Axis and Allied countries, armed with little more than a pair of binoculars, became the new first line of defense. 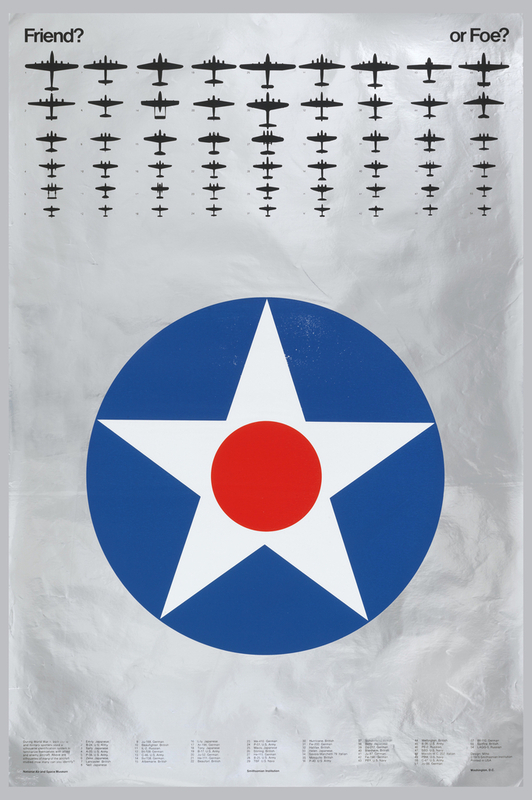 Silhouettes, such as those gridded along the top of the poster, were often used as teaching aids, simplified shapes that emphasize the telltale characteristic features of each plane and highlighted each craft’s distinguishing structural characteristics. Similar designs were printed in training guides, pamphlets, and on flashcards, leaving behind for the researchers of today an interesting array of wartime material culture. In many objects, especially those targeted at young children, the line between game and military propaganda becomes blurred. One such object found in the New York Historical Society’s collection, a bubble gum trading card wrapper manufactured by Bazooka (ca 1940-1946), offered young Americans a way of learning aircraft identification while they enjoyed a sugary treat. While objects targeted at children, such as the Bazooka wrapper, might seem like nothing more than harmless play, the reality is that young adults were active participants in official military aircraft observation units. A recruitment pamphlet published in February 1953 by the United States Ground Observer Corps informs readers that, “Russia, knowing full well the power of our bomber force, has an active air defense system including ground observes,” continuing that, “Each American citizen has a place in national defense and if everyone mans his or her post, that fact alone would deter an enemy from launching a sneak attack.” In anticipation of the Cold War, the pamphlet calls for the immediate recruitment of at least 500,000 volunteers, concluding with a statement of the surprisingly minimal member requirements: “Any loyal citizen, men or women, including teen-age boys and girls. The prime prerequisite is mature judgement.” How something as objective as “mature judgement” was measured is unmentioned, but through the Observe Corps a diverse array of Americans, from housewives to boy scouts, suddenly had an outlet for their impassioned patriotism. Carlin Soos is a second year Master’s student at the Bard Graduate Center and a graduate intern in the Department of Drawings, Prints, and Graphic Design. Veronique Vienne, “Tomoko Miho, Biography,” American Institute of Graphic Arts (AIGA), 1999, http://www.aiga.org/medalist-tomokomiho/. Ground Observer Corps: Guard Our Country (Washington, D.C.: U.S. Government Publishing Office, 1953). Many thanks to the library staff at the University of Florida for providing a reference scan of this document. Poster, Friend? Or Foe?, 1976. screenprint on metallic coated paper. Gift of Various Donors. 1981-29-153.